‘Gastropub’ was a buzzword in the west during the whole of last decade, and my first such experience was the Devonshire Arms (now shut) run by Gordon Ramsay in London. It was a typical pub like feel with wooden interiors but unlike pubs they served artisanal 3 course meals and had an elaborate menu like a restaurant and hence called a gastropub. This concept has been creating a fizzle in the Indian scene for around 2 years now with the first Indian one being the Monkey Bar in Bangalore, wasn’t impressed with the vegetarian selection and the food overall there though. 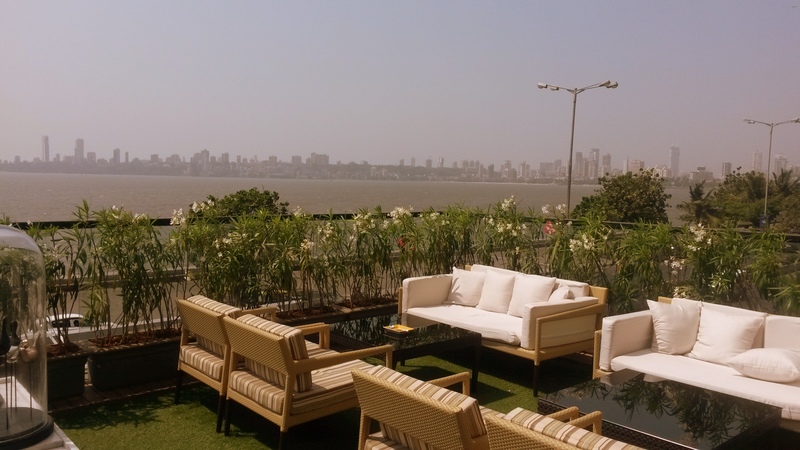 Nonetheless the latest addition to the list is a 3 month old place ‘Long and Short’ at the Intercontinental hotel, Marine Drive. Situated on the first floor; it also has a terrace seating facing the Arabian. The décor is chic and trendy with a lounge-like seating, too neat to be pub-like. They are open from 7am – 2am and operate for all meals; it actually doubles up as the all-day diner for the hotel. I grabbed my most favorite seat in a bar, the one at the bar. 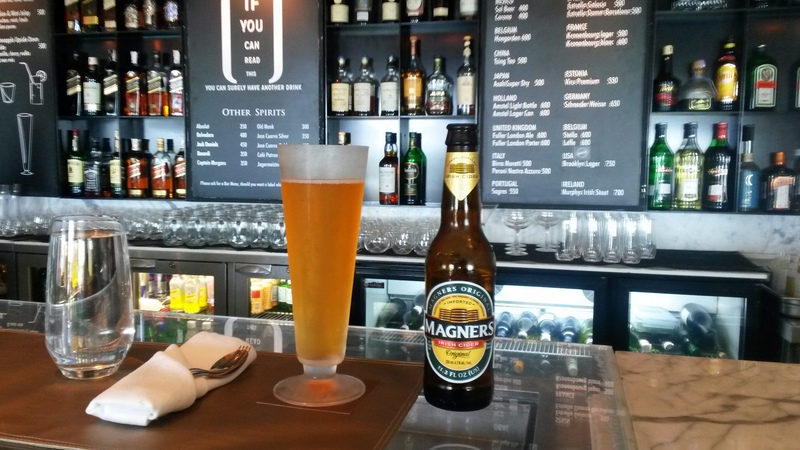 A quick glance at the menu and I saw Magner’s cider, an apple based fermented drink made in Ireland, ordered one without a second thought. I was refreshed in a couple of sips but I thought it was not as fragrant and fresh as it is supposed to be, the label said imported in ‘April 2013’ and I understood the story. The drink selection included a good selection of beers (domestic starting at 225++), cocktails (starting at 500++), Shooters (300++), a limited selection of other spirits and wines. Indian wine at 600++ was very steep I thought. 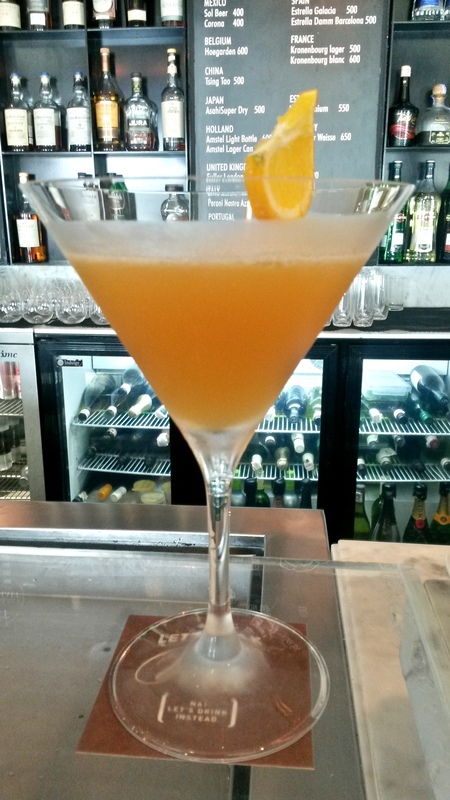 My second tipple was the South West maple with Bourbon, Maple syrup, Sweet and Sour mix and orange (600 ++). Simple and a straight forward mix. I was really gung-ho and counting on the menu to be different. It was grouped in to shorts (appetizers), Soups and Salads, Flatbread Pizzas, Burgers and Buns, Entrees and Grills and desserts and the cuisine ranged from Indian to oriental to Italian to Middle Eastern. “We have tried to keep it simple but given a twist to most conventions for example a Biryani with mince. We improvise based on guest feedback and have launched a new menu within a few months of launch. We will keep up the dynamism in the menu” asserted Paul Kinny, the executive chef of the hotel. 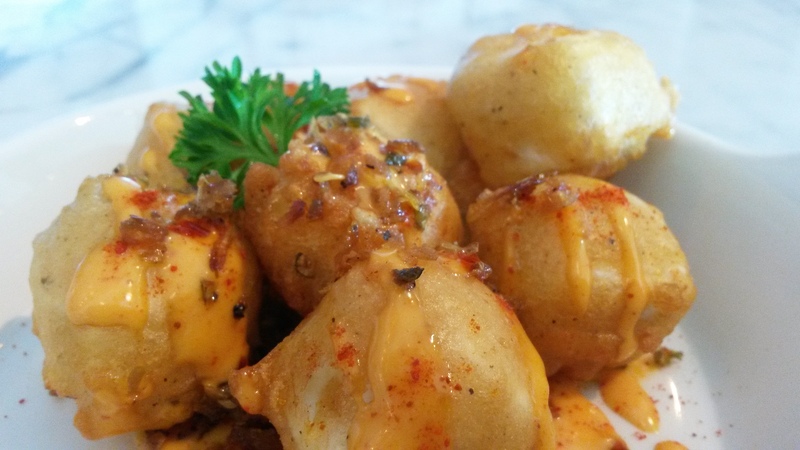 Sichuan dusted Cottage Cheese: Chunks of paneer fried in a light beer batter and drizzled with a creamy chilli sauce. Very good ‘Chakna’ I must admit. Steamed Chilli corn dumplings: The twist here the used of potato flour for the skin, and the citrusy broth the dimsum come in. 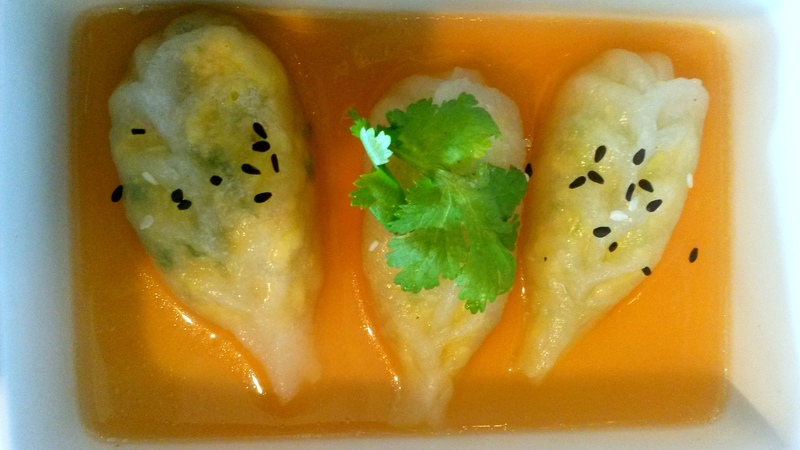 The dumplings remain moist coupled with a zesty note from the broth. 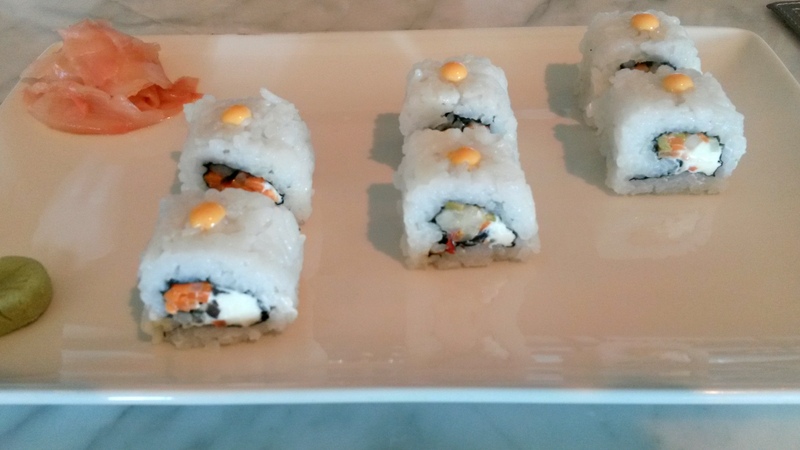 Truffled Sushi Rolls: The best ‘veggie’ sushi I have had till date. Pickled veggies and cream cheese with truffle oil. I could eat them all evening. Spicy House Special Pizza: Paper-thin crisp version, did not like the base though. It was crispy but chewy and lacked flavour. The waiter mentioned though that pizzas were a fast moving item, not for me please, thanks! Bombay Masala Club: This creation may seem simple but it is well thought of. 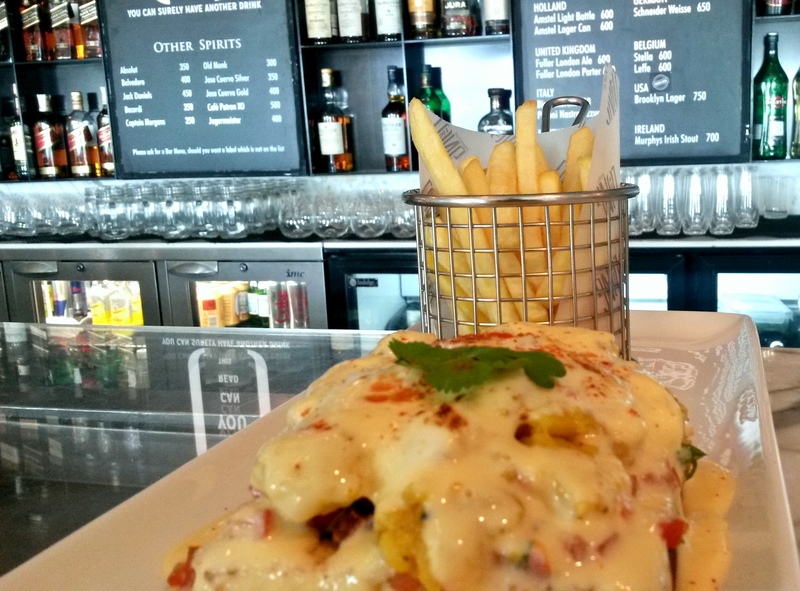 Yes it is inspired by the local Mumbai Sandwich, with potato sabzi but done on a brioche slice which is much more richer, a not so sharp salsa instead of the veggies , potato sabzi and covered with a generous helping a of a nacho cheese sauce. Loved every single bite! Peach Melba Cheese Cake: A version of the Philly cheese cake with a Oreo crust and poached pear bits inside. It was rich, cheesy and flavorsome and but yes I thought the Oreo crust was an audacious attempt since I do not like Oreos and I am sure there are many like me. Also there was a mysterious smoky element to it which resembled smoked cheddar. Couldn’t figure that out! 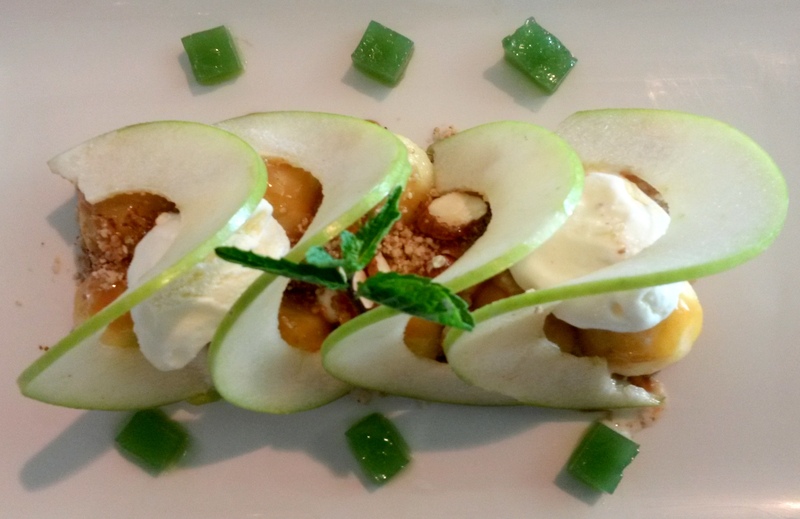 Green Apple Crumble Deconstruct: “Deconstruction’’ is a modern day food technique where a food item is presented with all the ingredients processed separately and put together on a plate. This Apple crumble had the caramel, poached apples, candies walnuts and almonds, crumble and vanilla icecream. I though the idea to use granny smith apples for the sweet and sour combo was good but then these apples were very tart and outdid the other flavours. 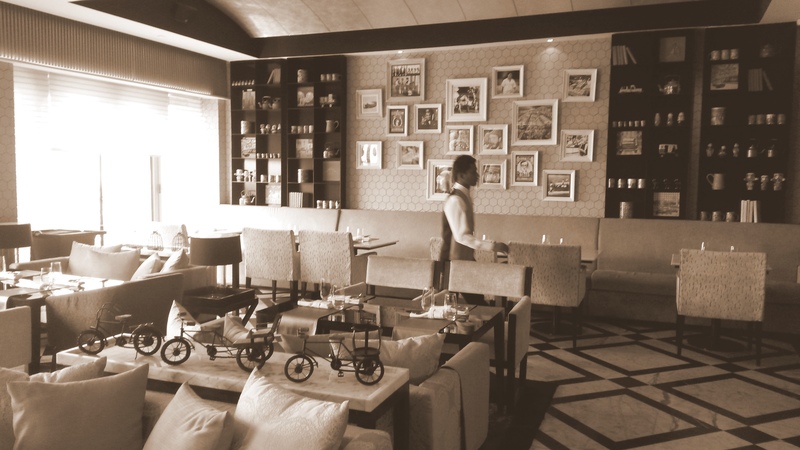 Most of the veggie appetizers and mains are in the range of 400-600 exclusive of a 12.5 percent service tax. Meal for two with 2 each of the starters and mains and a dessert will set you back by 2000 Rs. You like fusion food; this is the place to be. “Mood adjustment hours’ Buy 2 get 1 from 1700-2000hrs. Check for dates on imported drinks. My cider was ‘tired’. The menu could be bit misleading and it could lead to disappointment. For example if you expect your chicken club to be a triple decker then here it arrives open-faced on a brioche. However the servers are trained to consult you on every dish. Ok so the long and the short of it is that I am going back for more. Mushroom and Feta Sandwich, the burger with hung yogurt and potato patty and the Cheese fondue with some more cocktails on my wish list for the next.